Purdue’s Xiumin Diao has developed a new patented design for drones that enable them to work in windy condition and carry larger payloads. 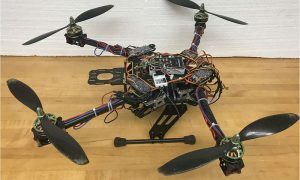 According to the assistant professor and his team, most drones are not able to withstand wind because of their fixed-arm design. The novel design provides drones with improved stability in windy conditions because the folding arms can move and change the center of gravity of the device during flight. It also makes drones more energy efficient because the movable-arm technology allows for the use of the full range of rotor thrust. Carrying larger payloads is also possible now as the movable arms can liberate part of rotor thrust to fight the weight on the overall device. The foldable arms of the drone could be useful in search-and-rescue operations as they navigate the air conditions in ravaged areas and morph by moving the arms to go through narrow spaces. Diao worked with the Purdue Office of Technology Commercialization to patent his device. He and his team are now looking for additional researchers and partners to license the technology.